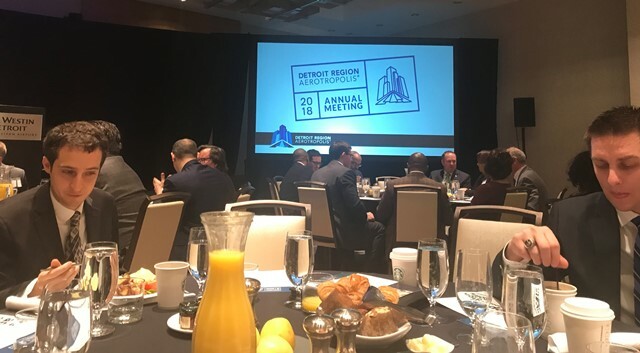 HURON TOWNSHIP, Mich. - April 21, 2018 - PRLog -- The Detroit Region Aerotropolis Corporation recently presented its 2017 annual report to its stakeholders at the Westin Hotel at the Detroit Metro Airport. According to Robert Luce, Executive Director of the DRA, "It has been a pivotal year in transforming this group with a new leadership team and be able to show concrete results of the team's efforts in 2017." The groups stakeholders include, the Cities of Romulus, Taylor, Huron Township, Van Buren Township, Washtenaw County, Wayne County, Wayne County Airport Authority, Michigan Economic Development Corporation and DTE Energy. Highlights for the region include fifty-one projects for possible relocation or expansion during 2017 and one hundred forty-seven sites were submitted for consideration. Three projects with Amazon, Penske and Brose closed with 1.7 million square feet and $343 million-dollar capital investment with 2,300 new jobs to these areas. Brose is in the Local Development Finance Authority district in Huron Township. It's $105 million-dollar project with a 235,000 square foot expansion of their manufacturing facility was chosen over competing sites in the U.S. and Mexico. When completed it will result in the creation of 600 jobs and make Brose the largest employer in Huron Township. Keynote speakers included Wayne County Executive Warren Evans, Andy Labarre and Jeff Mason. Warren Evans opened by emphasizing the need to develop relationships to get work completed. He has been with Wayne County for 50 years and wants to change the direction of leadership in his position by creating a pleasant work environment. He said, "I will continue to invest in the region, including procuring a plan for future needs by preparing for mass transit. Employers need employees and mass transit will get them to work, but it needs to be designed as a region." There are some initial considerations for expansion to the Downriver area as well. Andy Labarre, Chairman of Washtenaw County Board of Commissioners was reflective of the theme for investing in people, partnerships and creating broader benefits for the region. Jeff Mason CEO of Michigan Economic Development Corporation, put his bet on talent not tech in his address to the group. He believes that if we hire the right talent like Rob and Warren we will see results from great leadership. High skilled, high tech talent is needed in Michigan and we are seeing an increase in the Great lakes region of in-bound talent of 24-28 years olds with those talents, right now. It is predicted that 800,000 jobs will be needed by 2024. John Gallagher, senior business columnist for the Detroit Free Press presided over the panel discussion including questions of infrastructure and concluded that a focused approach to get jobs done needs to be a regional approach, which it really hasn't in the past. It was interesting to note in Denver mass transit was turned down 41 times before it passed and ultimately the plan was in place and completed much quicker due to regional team work. The Detroit Regional Aerotropolis is determined to prove even better results in 2018. "Not only do we believe we have the properties, we have the service and support business needed to relocate in our beautiful township." Said R.P. Lilly, LDFA Chairman. "Companies are amazed how easy we are to work with." The LDFA parcels range from 2.7-22 acres of buildable land and the location are convenient to Detroit Metro Airport, major expressways and railways. The group is looking for high tech, manufacturing and energy business to call Huron Township home as they concentrate their current efforts on the LDFA2 Pinnacle Areo Park.